European Alphabets, traditionally follow sequence from A to Z. Similarly, in Indian languages, it is from क to ज्ञ. However the main difference being presence of logical sequencing of order. Indian अक्षर sequenced in a logical, speech-pattern order. This manner of arrangement of Indian ‘Akshar’ (अक्षर) is known as ‘Varna-Mala’ (वर्णमाला). Sanskrit ‘varna-maala’ is shown below. The first line represents vowels and rest of the lines, consonants. 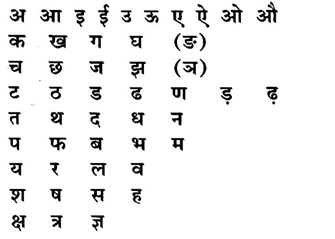 Indian alphabets are not sequenced arbitrarily but are grouped together based on the science of speech. Consonants are grouped in according to the usage and position of the tongue during their pronunciation. Those ‘Akshars’ that need touching the tongue to teeth are all grouped together and so also those where tongue touches palate and so on, again these are divided on the basis of how much air is required for speaking. In sequence, these categories are: velar, palatal, retroflex, dental, labial, sonorant and fricative. Among the first five groups, the ordering starts with the unaspirated voiceless, then goes on through aspirated voiceless, unaspirated voiced, and aspirated voiced, ending with the Nasal. Sanskrit and other Indian languages have another unique characteristic. They have several synonym words for the same entity but rarely interchangeable by other as each word conveys specific context or attribute. Moon, चंद्र, शशांक, ईन्दु, etc. Water, जल, पानी, निर, etc. Sun, आदित्य, भास्कर, रवि, सुर्य, etc. Sanskrit is an ancient language. World’s first known literary records (Rig-Veda) were written in that language. Over period of several millennia, a lot of rich literature is produced in Sanskrit language. Literature includes epics such as Mahabharata and Ramayana, Vedas and Upanishads, Raghuvansh, Harivansh, Shakuntal, Meghdoot, and thousands of other volumes were created by legendary authors such as Vyas, Valmiki, Kalidas, Harsh Vardhan, etc. Do not be surprised when you look up Merriam Webster Dictionary, at http://www.merriam-webster.com/dictionary/sanskrit?show=0&t=1394686779 and it shows, etymology of the word ‘Sanskrit’ as “saṁskṛta, literally, perfected, from sam together + karoti he makes”. (you will see parallel between ‘sam’ and English words ‘sum’ and ‘krita’ with ‘create’). Sams and Krita words together means ‘Created Perfectly’. And, truly so, this language leaves us wondering at its extent of perfection.